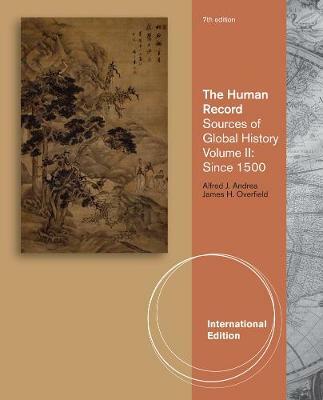 THE HUMAN RECORD, International Edition is the leading primary source reader for the World History course, providing balanced coverage of the global past. Each volume contains a blend of visual and textual sources which are often paired or grouped together for comparison. A prologue entitled "Primary Sources and How to Read Them" appears in each volume and provides background and guidance for analyzing sources such as those in the text. Approximately one-third of the sources in the Seventh Edition are new, and these documents continue to reflect the myriad experiences of the peoples of the world.